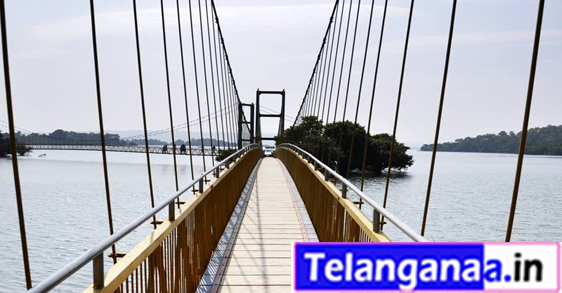 Lakhnavaram Lake, located in Govindaraopet Mandal about 70 kilometers away from Warangal, is a trending picnic spot. The lake is an exceptional thing of beauty. The lake was formed by closing down three narrow valleys. Each valley is replaced with a short bund, and hills act as their natural barrier. The lake has been constructed by the rulers of the Kakatiya dynasty in 13th Century A.D. An added advantage is that the lake takes shelter in isolated surroundings and this makes your holiday very private. The entire region seems bountiful with green crops and pleasant water resources. The Lakhnavaram Lake which hides itself amidst the hills was discovered during the Kakatiya reign and the rulers expanded it to grow as a source of irrigation. An added attraction to this mystic beauty is the suspension bridge. The hanging bridge takes you to the mini island in the lake. The authorities maintaining the lake also provide boat riding facility which will take you close to the most serene part of the lake. Lakhnavaram is located at a distance of nearly 70 km from Warangal city and is well accessible by road. Haritha Lake View Resort at Lakhnavaram offers delicious fare for tourists visiting Lakhnavaram lake. Haritha Lake View Resort at Lakhnavaram, located approximately 260 km from Hyderabad in the midst of the dense forest region of Warangal is a nature's paradise. Stay at Haritha Lake View Resort to experience the best A/C and Non A/C accommodation and also other facilities available at this Resort.